Remember Digg, the social news titan that tanked when a new update chased off its user base? It’s back, under new ownership, and with a different strategy. After a six-week sprint to reinvent the site, it has relaunched in its new form. There are no comments yet, as the developers didn’t feel they could build a good threaded commenting system in that time, and a Facebook account is required for now, as they don’t have spam filters in place yet. Before, Digg followed the simple paradigm of “sort user-submitted links by the number of votes they receive.” Now, it’s trying to be something more like a cross between Slashdot and Techmeme, with a little bit of inspiration from The Verge’s design. Stories are now ranked not just by votes, but also by the number of times they’re shared on social networking sites. If you share or like a link on Facebook, Digg considers it to be a vote. If you retweet a link on Twitter, Digg counts it as a vote. Placement on the page is determined not only by a ranking formula, though, but also by manual moderation. Digg 4: It’s Actually Usable Now! I stopped using Digg a year or two ago because the quality of the links on the front page was rapidly deteriorating. Also, the trollish users were really getting on my nerves. The new Digg Version 4 changes all of that, and turns the site into a place that’s actually pleasant to use. You get a customized Twitter-style feed of the profiles you “follow,” which is sorted by the number of votes the articles receive. I had been beta testing the site for awhile, but it’s live for everyone now. The content is better, since you have more control over what you see. And most of the posts I end up seeing have zero comments, which is also nice. You probably remember the controversy over Digg’s “DiggBar.” Marketed as a URL shortener integrated with Digg, with some other sharing options as well, it had a rough start because of a few technical and behavioral problems that web publishers weren’t too happy about. Well, the DiggBar is “evil” again. A few days ago, Digg threw the switch on a change to how the DiggBar works. No longer do Digg short URLs (e.g. http://digg.com/u39A9h) automatically redirect to their target. They now point you to the Digg page instead of the source. As we’ve stated in the past, the DiggBar is meant to streamline the Digg experience and provide our registered users with the opportunity to catch up on comments, related stories and additional source content. Our strategy with Digg short URLs is to facilitate sharing of Digg content, not to be a conventional redirection service. They pulled a bait-and-switch, moving from something that made sense, and could potentially bring more traffic and content to Digg, to something that users won’t find anywhere near as useful. People want to share content, not pages that link to content. 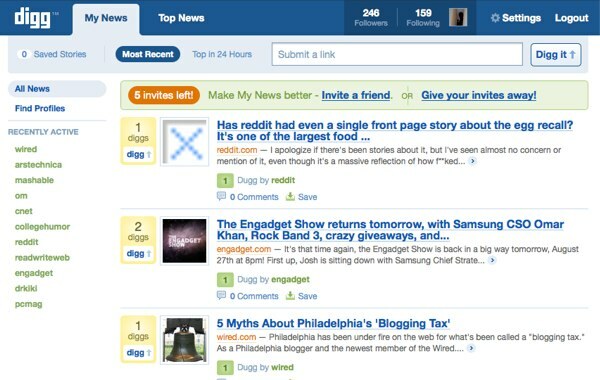 I previously talked about the controversy surrounding Digg’s new DiggBar. It continues, and gets more interesting. That sounds like a good idea. I checked the source code, the article links point to the original URL rather than the Digg short URL. While that’s nice of them, it doesn’t change the fact that the Digg URL is being propogated around the internet instead of the original URL, and that URL points to a page on Digg’s servers, rather than doing a simple 301 redirect, which instructs search engines to ignore the first URL and go directly to the original source. More PageRank for Digg, and none for you. Digg recently threw the switch on their new DiggBar, a little toolbar combined with a URL shortener. The toolbar is really an HTML frameset. Every link on Digg.com will have the DiggBar on top of it when you click through, unless you turn it off. You can also put any page into the DiggBar frameset by prefixing http://digg.com/ to the current URL, such as http://digg.com/http://www.google.com. You will be redirected to the short URL to the page with the DiggBar included. That’s the controversial part: Every page loaded into the DiggBar ends up with a TinyURL-style short URL that loads the page, with the bar atop it. This means that Digg doesn’t link directly to your site anymore. They link to their short URL (e.g. http://digg.com/d1lGIm), which displays your page in a frame. If someone decides to link to your page, are they going to go through the trouble to break the page out of the frameset and link to the original URL? Probably not. They’re link to the Digg URL instead, which displays your page in the DiggBar frameset. You don’t get any link juice, and the link is dependant on Digg’s URL working. The DiggBar may net you some more traffic, making it easier for your post to be Dugg and shared on Twitter and Facebook. (Functions for each are included in the toolbar.) I can’t say I like the downside though. Many bloggers invest a lot of time and effort in trying to get their work posted and promoted to the front page of Digg, hoping for a huge surge in traffic and instant fame. But really, is it worth it? Most of you have probably already learned that it’s hard to get Dugg. It doesn’t happen very often, unless you’re one of the few sites that seem to be perpetually on the front page, and you’re better off just focusing on your website, and hoping it will happen some day on it’s own. Everyone seems to be talking about Yahoo Buzz these days, and about how it’s going to give Digg a run for its money. Sure, the site is new and shiny. But they have nothing on Digg so far. Users of Yahoo Buzz can only vote on stories, they cannot submit them. Only select sites can have their articles featured (read: really big blogs). Yahoo says they are in beta, and are currently not accepting publisher applications. Digg needs some rethinking. If you know 1235 people, then you’ll have no problem getting something to the main page. If you don’t, it’s virtually impossible. I’ve submitted pages to Digg, only to have someone else submit a duplicate a few hours later (that later makes it to the Popular page). Digg needs some changes.